I recently traded a revolver for a Taurus 709 Slim. I thought maybe the 709 would make a good carry gun for my wife Joyce. It does fit her hand well and she likes the fact it’s a 9mm instead of a 380, but she hasn’t shot it yet. More on that in a minute. When I got the 709 home I discovered I couldn’t rack the slide consistently. In fact it would sometimes hang to where the only way I could get it to open the action was to lift up on the slide, then pull it back. My good friend and fellow instructor, Jerry Colliver, took it to his shop, did a little grinding and polishing and now it racks reliably every time. The previous owner told me it didn’t like Winchester White Box ammo. He had settled on Winchester SXZ-9, which he said worked well in the gun. I took it to the range with some Federal FMJ, the Winchester SXZ and some Hornady Critical Defense, I also had a few rounds of WWB. After Jerry’s work on the gun it handled all of the ammo without a problem. How did it shoot? It’s accurate, surprisingly accurate. But it’s not going to be a gun Joyce will like. There’s just not enough room to get enough grip on it to hold it down when it fires. In my hands, the recoil seemed stronger than either of my 45s. It’s just a lot to hold onto. And to think they make this gun in a 40 caliber, too. It’s not a fun gun to shoot, but it is an easy gun to conceal and if you’re using it for defense because you can’t conceal a bigger gun, I can see where it would have it’s advantages. 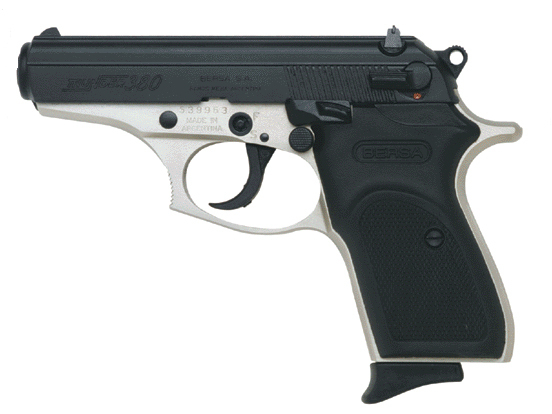 The second gun I want to tell you about is the Bersa Thunder 380. Jerry is a fan of this gun and he’s told me on numerous occasions it would be a gun Joyce could handle and would probably enjoy shooting. Two CHL classes ago we had two of the little Bersa’s in the line-up. Academy Sports has very reasonable prices on them, so I decided to add a .380 to my collection. If it looks like a James Bond gun, that’s because its design is based on the PPK Bond used to carry. It’s all steel and the one I got is in DuoTone colors as shown here. The external dimensions of Bersa Thunder and the Taurus 709 very similar. Though they’re shaped differently, they fit in the same space. 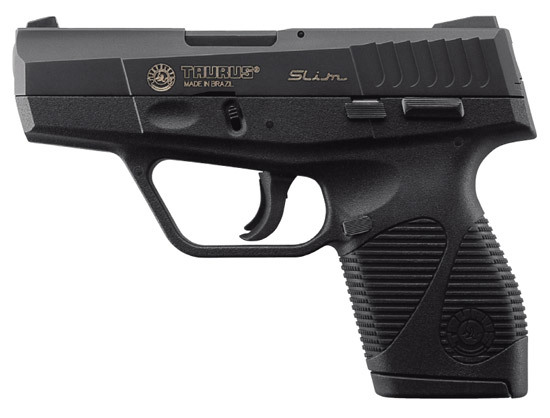 The Bersa is slightly heavier and shooting .380 as opposed to 9mm it has less recoil. Whereas I found the 709 uncomfortable to shoot, I could plink with the Bersa all day. It turns out that neither of these guns was right for Joyce. In fact she can handle a Glock 19 better and enjoys shooting it more. But that doesn’t detract from either of these pistols as a small concealed carry option for me or anyone who can rack the slide. Next Next post: The Ideal Life?